Our insufficient efforts to let the animals roam. Eyes flashed in the darkness. It was early October, 1970, and dozens of elk had congregated along the highway between Banff and Lake Louise. Interested only in each other—it was the height of mating season—the elk were heedless of the traffic pouring by. I worried each time my headlights picked up the retinas of these animals. Bad combination: fast-moving cars and large wildlife. Collisions had left bloodstains on the highway. What if an elk bolted directly in front of my old Volkswagen van? Fortunately none did, that night. Eight years later, when Sid Marty’s book Men for the Mountains came out, I was seeing far fewer elk along the Trans- Canada Highway. In a macabre way, the safety issue seemed to be resolving itself. Skid marks, burnt into the grey hardtop for 60 feet, showed that a car had been moving well over the posted speed limit. At the end of the track was a long streak of blood . . . . There was nothing else in sight. But the ravens, wheeling and rising again, impatient, meant that the animal was still alive. We were on bicycles, following the Trans-Canada south from Lake Louise. Having enjoyed 230 kilometres of safe, pleasant riding along the lightly travelled Icefields Parkway, we were now on the Meatmaker at its worst. We hugged the edge, riding in single file as a steady stream of cars and trucks whizzed by at our elbows. I had a rear-view mirror on my bike, as well as a wiggly red flag to alert the drivers coming up behind us. So far, so good. But suddenly the image in my mirror was terrifying: a car was passing unlawfully on the shoulder, closing quickly and not slowing down. Cia heard my shout. We both jerked our bikes off the pavement. As we wobbled onto the grassy verge and crashed, the car simply continued on its way. Neither of us was hurt, but we did the remaining stretch to Banff with our hearts in our mouths. In the years that followed, we saw news stories about cyclists who had not been as lucky as we were. And there were many items about motorists killed on the Meatmaker. Aye, the old two-lane Trans-Canada through Banff National Park was notorious. Twinned west from Calgary to the park’s east gate in the early 1970s, the Trans-Canada was dumping many thousands of vehicles per day onto those two lanes. During peak periods traffic would back up from the Banff traffic circle to Castle Junction, 25 kilometres away. The fatality rate was well above the Alberta average. Something had to be done. In the late ’70s, the federal public works department announced it was going to twin the Trans-Canada Highway right through the park. The applause from Calgary must have been audible in Ottawa, but to many conservationists, myself included, bashing an expressway through the heart of the Bow Valley was a horrifying thought. The whole place was on the verge of being declared a UNESCO World Heritage Site. Why not just add enough passing lanes to break up the traffic jams and enough cops to keep order when the ski areas emptied out? There were public hearings on each of the proposed first two phases of highway upgrading: 13 kilometres from the east park gate to the Banff traffic circle, then 14 more to the turnoff for Sunshine ski area west of Banff. Public Works was the proponent; Parks Canada joined scientists and conservationists as intervenors. A panel deliberated and the engineers won out. Four lanes it was going to be, some of it divided, some of it side by side with a concrete barrier down the middle. The federal government spent $7-million on mitigation measures for Phase I of the Meatmaker upgrade, and even more on Phase II. Per kilometre this was by far the largest outlay of such money in Canada, perhaps in the world. A continuous wire fence 2.4 metres tall was installed to keep any animal larger than a snowshoe hare off the right-of-way. Three bridges functioned as wildlife underpasses by leaving space for animals to pass beside the water. Six dry underpasses were built, one of which was a round metal culvert four metres in diameter, while the other five were short bridge-type open spans of various lengths up to 22 metres. All of these were situated at spots where animals were thought to cross the road frequently. The designers had little background information to help them. Would the fence and the crossing structures do the job? Highway reconstruction began in 1979. By the time the full 27 kilometres of phases I and II were completed in 1987, some results were easy to see. Cars and trucks moved freely and the Banff traffic circle was now a high-speed interchange instead of a bottleneck. Safety was much improved, with far fewer head-on fatalities. The fence was indeed keeping nearly all the moose, elk, deer and bighorn sheep off the pavement, and since these large colliders were the main worry for motorists, from a driver’s point of view the fence was a resounding success. Anecdotal evidence and casual monitoring by park wardens showed that animals were indeed using the underpasses. Still, mistakes had been made. Ladders over the fence and one-way gates in it were not entirely animal-proof. (First rule of natural history: everything out there is smarter than we think it is.) Further, critters could wriggle under the fence, which was not tight to the ground everywhere. Dandelions and other rapidly growing vegetation inside the fence were now untouched by grazing animals and thus more plentiful, enticing bears to climb over the fence and get hit. Coyotes were being killed in large numbers. They could dig under the fence and cross the traffic lanes to hunt the rodents doing so well in the lush median. Less risky for the coyotes, but fatal for the bighorn sheep living beside the Vermilion Lakes west of Banff, was the discovery that it was possible to run the sheep up against the fence and kill them. Within a few years most of the flock had disappeared. The fence was particularly offensive, a wire barrier lurking at the edge of the woods for kilometre after kilometre. To me, the park looked like Banff National Game Farm. Such were the surprises generated by the initial phases of the project. No surprise to me was how bad it looked. Not the highway; as a work of engineering it was lovely. The views were more expansive than before, the majesty of the park more breathtaking to behold. What I saw, though, was the huge swath cut through the forest. What was once part of the park was now a freeway. The natural landscape had been injured, especially where the route had been blasted out of the bedrock. And the fence was particularly offensive, a wire barrier lurking at the edge of the woods for kilometre after kilometre. To me, the park looked like Banff National Game Farm. When phase IIIA of the upgrade (Sunshine turnoff to Castle Junction) was announced in the early ’90s, we learned that nearly all of the 18.5 kilometres was to be divided highway. In addition to fencing—at least the base of the fence was going to be buried this time—13 crossing structures were proposed by the consultants, all of them culverts. By this time culverts were known to be used less often by wildlife than open-span structures, but culverts were considerably cheaper to build than open spans. The cutback era was well on, and government funding of all kinds was down. The public consultation process had changed, too. “Parks Canada argued that they now knew all about twinning highways in national parks, so they didn’t need the extra element of scrutiny and thoroughness that they would get with a full panel- type review,” said McIvor. “No public hearings were held. 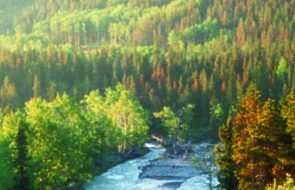 Just open houses, which were essentially sales jobs.” McIvor’s advice on behalf of the Bow Valley Naturalists was largely ignored, as were the recommendations of other environmental groups. None of this boded well for wildlife trying to cross the highway. Biologists and conservationists kicked up a fuss. Parks Canada responded by offering wider culverts and two open spans. Perhaps realizing the PR value of a visible gesture, the agency built two overhead crossing structures, each 50 metres wide. Few travellers on the twinned portion of the highway realized that wildlife underpasses even existed, but these $2- million overpasses were highly visible. They would demonstrate to everyone on the Trans-Canada that Parks Canada had done something significant for wildlife. Further, in 1997 the Yellowstone to Yukon Conservation Initiative had formed. The main message of its many participating scientists was that the entire Rockies region was becoming islandized. A scattering of wildlife refuges lay far from one another, separated by towns, farms, fences and roads. Animals couldn’t move easily from one core area to another. Their genes weren’t being exchanged freely, and gene exchange is a key requirement for long-term species survival. Wildlife habitat— especially large protected areas such as national parks—needed to be reconnected. Yet here in Banff National Park, an existing connection was being fenced off. I reasoned that the only way to let the natural world carry on its business in the presence of a superhighway was to either bury the road as a continuous tunnel or raise it as a continuous viaduct. In either case, wildlife could move from one side to other wherever and whenever they liked, with no risk of getting run over by traffic. I had said as much to Parks Canada during one of the “open houses” for Phase IIIA. The representatives had smiled politely as they dismissed my suggestion, saying that the proposed crossing structures would do the job just fine. Besides, any alternative to a standard highway was far, far too expensive to even contemplate. When construction of phase IIIA was well underway, Parks Canada did one thing right. In 1996 they hired Tony Clevenger, a respected independent wildlife biologist who was not involved in the design or placement of the crossing structures, to see how well they were working. Dr. Clevenger responded with a rigorous, peer-reviewable, six-year study. Using technology as simple as strips of raked soil that would record animal tracks and as complex as automatic cameras, the actual use of each crossing structure was monitored. Clevenger’s 2002 report totaled 432 pages. It was the best work of its kind done anywhere in the world. There have been a total of 29,343 through-passes by wildlife at the nine phase 1 and 2 underpasses between November 1996 and March 2002. Wolves used the structures 2,317 times, cougars 515 times, black bears 461 times, and grizzly bears 26 times. At the 13 phase 3A crossing structures there were a total of 8,036 passages by wildlife between November 1997 and March 2002. Cougars used the crossing structures 170 times, black bears 142 times, wolves 132 times and grizzly bears 25 times. In the 64 months of monitoring, more than 37,379 individual wildlife passes were detected at 22 wildlife crossing structures. The detail in the report goes on and on like this, showing how much Clevenger had learned about crossing structures and how wildlife make use of them. He is currently trying to identify individual animals, especially grizzly bears, by collecting their DNA from hair samples left on sticky strips. This is important new info, applicable to grizzly survival in the park. Clevenger has carefully worked out the crossing-structure setup for the upcoming twinning from Castle Junction to Lake Louise, where a few kilometres are already twinned, and on to the western park boundary. He’d like to see 20 structures installed over the 33 kilometres of the upgrade, including seven structures 70 metres wide, which is 20 metres wider than the previous maximum, and a lot of narrow-diameter culverts, which he has discovered many smaller animals will use. All 20 major structures would be located at or close to natural crossing sites. A number of them are must-build highway bridges that would merely be lengthened for use as wildlife underpasses. If his recommendations are followed, Clevenger is confident that these structures will be more effective than the older ones in the other phases. But will animals use them enough to crack the islandization problem? When I spoke to University of Calgary geography professor Shelley Alexander, she was doubtful. Alexander did her PhD thesis on wildlife crossings of highways in various locations in southern Alberta. These were over-the-pavement crossings of two-lane highways, not four-lane ones. One of her study locations was section IIIB of the Trans-Canada, the stretch remaining to be twinned. Thus, Alexander’s work provides baseline information that will help determine whether the structures Clevenger has recommended will make the upgraded highway more crossable than it is now, before twinning. Like Clevenger, Alexander is hoping for the best. But her data show that significantly more animals make it across the heavily travelled two lanes of IIIB than they do under and over the four lanes of IIIA. The habitat is fairly similar through both sections. Does this mean that an upgraded IIIB, despite more and better crossing structures, still won’t be crossed more often than it is now? Which brings us to the final chapter in this story: the planning for Phase IIIB of the Trans-Canada upgrade, the final 33-kilometre stretch in the western part of the park. 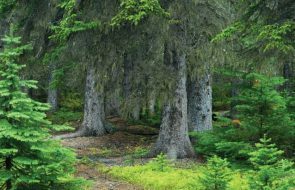 Parks Canada seems to have learned little from its experience with phases I, II and IIIA, except how to put the run-around on those of us urging higher standards on IIIB, the last chance to get things right. Jim Pissot, executive director of Defenders of Wildlife Canada, is annoyed about this. 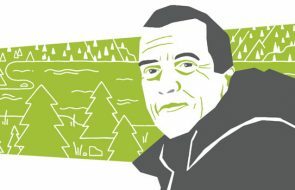 I had met Pissot in December of 2003 at a gathering of conservationists concerned about IIIB, and we had collectively chosen him to represent us on a Parks Canada advisory committee of “stakeholders.” Last September, I spoke with Pissot in his Canmore office about how things had been going. Pissot was shocked when he saw the preliminary planning documents for IIIB. The highway designers seemed not to have heard of Tony Clevenger. His name could not be found, and the original background paper called for less than half of the mitigation work Clevenger had recommended. If we can bridge the stormy sea for 13 kilometres between the mainland and PEI, surely we can raise 33 kilometres of the Meatmaker in Banff National Park. Naturally, this brought a chorus of protest from scientists and conservation groups. Members of the advisory committee— even the truckers—agreed that Clevenger’s work was good and that his recommendations should be followed. Parks Canada had little choice but to go along. However, the final structure widths were less than he had advised, and Shelley Alexander’s plea for long elevated sections had been rejected completely. Banff, our oldest and most popular park, is vastly important to Canadians. In fact, Banff National Park and its wildlife are right up there with the flag and the Mountie in red serge as world-renowned symbols of our country. So why is Parks Canada doing such a dubious job of protecting wildlife along the nation’s number-one highway in the nation’s number-one park? With that question in mind, I went to see Terry McGuire, the Parks Canada transportation engineer who was in charge of the IIIA upgrade and is now directing IIIB. From his office in downtown Calgary, McGuire assured me that Clevenger’s report will be followed in type, number and placement of crossing structures. He showed me the plans. Okay. What he said next, though, gave me a chill. “As we envision it, the whole of IIIB requires about $160-million to build. We have an appropriation of only $50-million.” Yikes! Would the project be low-balled by $110-million? No room for wildlife underpasses in that. But McGuire had a solution. He’d build IIIB in segments, spending that first $50-million on a section 10–12 kilometres long from Lake Louise toward Castle Junction, which takes in a particularly bad accident zone. The crossing structures would be included. After that, he’ll see how much money he is given and when. Terry McGuire may be painted as the bad guy punching IIIB through with inadequate mitigation, but I can sympathize. This is third-world stuff he’s having to deal with. In Canada, no respectable engineer should have to put up with such gross underfunding. This isn’t a matter for McGuire, it’s a matter for Parliament. Which is where you and I should go with our concerns. Parks Canada needs money, and it needs it fast. It needs enough to repair a lot of decrepit campgrounds, enough to hire a sufficient number of wardens, and—especially—it needs enough to finish its upgrade of the Trans-Canada Highway with guaranteed wildlife permeability. The mountain national parks of Alberta and British Columbia are essential to the survival of many species that are extinct or in decline elsewhere in the Rockies. We have to give these critters every chance we can. Tony Clevenger told me that he would like to see more and wider crossing structures. Shelley Alexander, Jim Pissot and Mike McIvor would all like to see long sections of raised road. Heck, I think we should elevate the whole of IIIB and continue it as a viaduct through Yoho, the next park to the west, setting a high standard for other jurisdictions to emulate. If the U.S. can elevate over 80 kilometres of interstate highways across the swamps of Louisiana, and if we can bridge the stormy Northumberland Strait for 13 kilometres between New Brunswick and PEI, surely we can raise 33 kilometres of the Meatmaker in Banff National Park. Yes, the cost will be high—double $160- million, triple or more. Terry McGuire estimates a tenfold increase. It might cost as much as a couple of weeks of fighting in Afghanistan. But this is a wealthy country. We can afford it. Ben Gadd is a naturalist and author of Handbook of the Canadian Rockies and a novel, Raven’s End.